Amazon.com description: Product Description: The bestselling, award-winning author of The Radleys is back with his funniest, most devastating dark comedy yet, a âsilly, sad, suspenseful, and soulfulâ (Philadelphia Inquirer) novel thatâs âfull of heartâ (Entertainment Weekly). When an extra-terrestrial visitor arrives on Earth, his first impressions of the human species are less than positive. Taking the form of Professor Andrew Martin, a prominent mathematician at Cambridge University, the visitor is eager to complete the gruesome task assigned him and hurry home to his own utopian planet, where everyone is omniscient and immortal. He is disgusted by the way humans look, what they eat, their capacity for murder and war, and is equally baffled by the concepts of love and family. But as time goes on, he starts to realize there may be more to this strange species than he had thought. Disguised as Martin, he drinks wine, reads poetry, develops an ear for rock music, and a taste for peanut butter. Slowly, unexpectedly, he forges bonds with Martinâs family. He begins to see hope and beauty in the humansâ imperfection, and begins to question the very mission that brought him there. Praised by The New York Times as a ânovelist of great seriousness and talent,â author Matt Haig delivers an unlikely story about human nature and the joy found in the messiness of life on Earth. 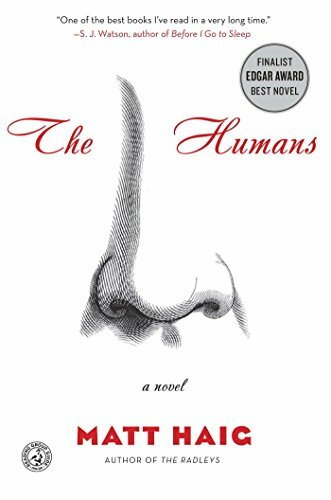 The Humans is a funny, compulsively readable tale that playfully and movingly explores the ultimate subjectâourselves. About: The bestselling, award-winning author of The Radleys is back with his funniest, most devastating dark comedy yet, a “silly, sad, suspenseful, and soulful” (Philadelphia Inquirer) novel that’s “full of heart” (Entertainment Weekly). from Simon & Schuster (July 2, 2013); titled "Humans"